This is a two minute exposure of the Castle Hill Lighthouse at sunset. Used a 10-stop neutral density filter and blended two exposures to achieve this effect. 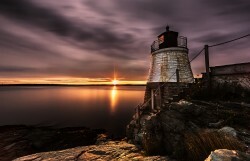 The lighthouse is located behind the Castle Hill Inn in Rhode island.